Love ear piercings, but want to try them out first? No problem! Take a picture of yourself and try out our beautiful, 100% hypoallergenic studs and earrings. If your device does not have a camera built in, you can use existing pictures too. Ask for stores that use Studex® instruments. It's safe and hygienic, and with our patented Studex® System75™ you'll hardly feel it. Only the best for your ears™ — from Studex, the world's leading ear piercing brand. Having trouble using the app? This document might solve your problems. I clicked "allow" but the webcam area remains black. Some browsers require you to allow access too. Now that you have given the Flash Player access to your webcam, check for a dialog in your browser. 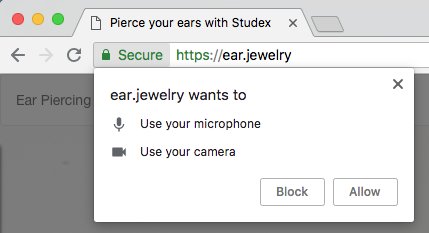 I cannot click the "allow" button in in the webcam area. Click "Camera and Microphone Settings by Site..."
Refresh the webpage in your browser. Still not working? Send us an email.